FCA Canada is pleased to announce pricing on all-new 2020MY Jeep Gladiator – the Most Capable mid-size pickup ever. 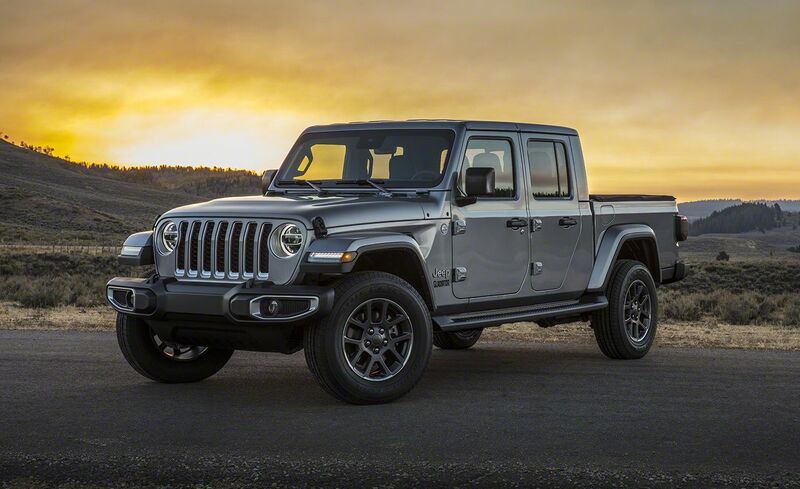 The all-new 2020 Jeep Gladiator boasts a rugged, distinguished design that is immediately recognizable with traditional Jeep design cues. Gladiator Overland and Rubicon models offer available LED headlamps and fog lamps that project crisp white lighting. Gladiator models equipped with LEDs feature daytime running lights, which form a halo around the outside perimeter of the headlights. Forward turn signals are positioned on the front of the trapezoidal wheel flares. From behind, traditional square tail lamps feature available LED lighting and give way to a wide tailgate opening for unobstructed loading of cargo into the bed. The tailgate is damped and capable of stopping in three positions, while cargo is easily secured with four built in tie-downs and available three position power-locking tailgate. The heritage-inspired centre stack features a clean, sculpted form that complements the horizontal dashboard design and sports a finish dictated by the model choice. A hand-wrapped instrument panel features a soft-touch surface with accent stitching on Gladiator Overland and available on Rubicon models. Functional features, including climate and volume control knobs, media charging and connectivity ports, and ESS control are all sculpted for quick recognition and are easily within reach of the front-seat occupants. Inboard and outboard circular HVAC vents are surrounded by a platinum chrome bezel for a precise and premium yet rugged appearance. All-new rear seats feature high-quality premium materials giving the seats an athletic look and delivers comfort and support. The rear seats, exclusive to Gladiator, features segment-leading rear leg room and utilizes a unique design that can be locked in place to provide secure storage behind the seat back. The instrument cluster features a 3.5- or an available 7-inch thin-film transistor (TFT) vehicle information display. The 7-inch TFT display allows the driver to configure information in more than 100 ways, including current media being played, tire pressure, tire-fill alert, or digital speed readout. Integrated buttons on the steering wheel control audio, voice, and speed functions and allowing the driver to keep their hands on the wheel at all times. The available 7.0- or 8.4-inch touchscreen displays house the fourth-generation Uconnect system and sits prominently atop the centre stack. The fourth-generation Uconnect system enhances the user interface and system performance with quicker startup times and improved screen resolution. A 5.0-inch touchscreen is standard on Gladiator Sport S. Directly below the touchscreen are functional features such as climate and volume control knobs and media connectivity ports. Most capable midsize pickup ever! Gladiator Sport S, Overland and Rubicon models all receive a Trail Rated badge thanks to legendary Jeep 4x4 capability. The all-new 2020 Jeep Gladiator delivers legendary off-road capability courtesy of two advanced 4x4 systems. The Command-Trac 4x4 system, standard on Sport S and Overland, features a two-speed transfer case with a 2.72:1 lowrange gear ratio, and heavy-duty third-generation Dana 44 front and rear axles with a 3.73 rear axle ratio. On Gladiator Rubicon, a Rock-Trac 4x4 system features heavy-duty third-generation Dana 44 front and rear axles with a “4LO” ratio of 4:1. A 4.10 front and rear axle ratio is standard as are Tru-Lok front and rear locking differentials. Gladiator Rubicon models offer improved articulation and total suspension travel with help from a segment-exclusive electronic front sway-bar disconnect. With the standard six-speed manual transmission, Gladiator Rubicon has an impressive crawl ratio of 84.2:1, and 77.2:1 on Rubicon models equipped with the optional eight-speed automatic transmission – both of which makes scaling any obstacle on the trail easy. Both Command-Trac and Rock-Trac systems offer full-time torque management, enabling optimal grip in low-traction conditions. Gladiator’s body-on-frame design uses advanced materials and engineering to be lightweight yet stiff and durable, and features an all-new lightweight, high-strength steel frame. When compared to Jeep Wrangler Unlimited, Gladiator’s frame is an additional 78 centimetres (31 inches) longer while the wheelbase is 49 cm (19.4 in.) longer. The longer wheelbase and the bed’s positioning centre aft of the rear axle centerline enables for better weight distribution and a more comfortable and composed ride when carrying cargo. The prop shaft, brake and fuel lines and exhaust system were lengthened to accommodate the changes needed to make the proven body-on-frame design work with the most capable midsize truck ever. The new 2020 Jeep Gladiator is offered in three unique models. Overland features bright exterior accents and standard black hard top and refined on-road driving. Gladiator Rubicon is the most-capable, off-road mid-size pickup ever with classic Jeep design and segment-exclusive off-road equipment. Dealer ordering for the new 2020 Jeep Gladiator will open at a future date.